The Big Half Deal (B.H.D.). This is a special, larger diameter version of the 85mm-wide carbon Big Deal rim. With a 27.5-inch size, it's smack-dab-half-way between a 26" wheel and a 29" wheel. 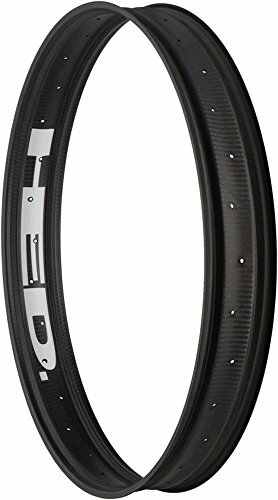 If you have a new-fangled 27.5" fat bike, this is the performance rim choice. Do not use tire levers. Can be set up as tubeless without the use of tubeless tape with the use of HED's Tubeless spoke head washers. Color: Black. Weight: 465. Hub Drilling: 32. Manufacturer Spec ERD: 589. Valve: Presta. ISO Diameter: 584 / 650b / 27.5". Wheel Size: 27.5". Tire Type: Tubeless Ready. Rim Center Offset: 0. Rim Joint: Carbon. Brake Track: Carbon. Defined Color: Black. Rim Width (External): 85. Rim Material: Carbon. If you have any questions about this product by HED, contact us by completing and submitting the form below. If you are looking for a specif part number, please include it with your message.